Love shooting some hoops? Getting those three pointers in from a distance is certainly one feeling that cannot be beat, even more so when you are in a crowded stadium, with hostile opposing fans all around you, doing their best to heckle you so that you miss your shot, and there are mere seconds on the clock before your team loses by one point. You jump, and you shoot! Scoring such a winning point is definitely high on the list of many a kid or teenager, and to be able to deliver under such circumstances, practice is the keyword. After all, should you be rewarded with more than just a nice feeling for getting the ball in? With the £39.99 SKLZ Shoot Around, each time your ball goes through the basket, you will have it go down the chute, and back at you – so there is no need to walk towards the ball to retrieve it. Certainly sounds like a decent time saver to me, and rewards you for getting the ball back faster so that you can continue to line up the next shot. 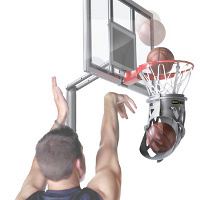 With the Shoot-Around’s rotating 180-degree ball return, you are able to take aim from just about any area around the hoop.